Ross County’s wait for a league win in 2017 continues after they lost 2-1 to St Johnstone at Victoria Park. 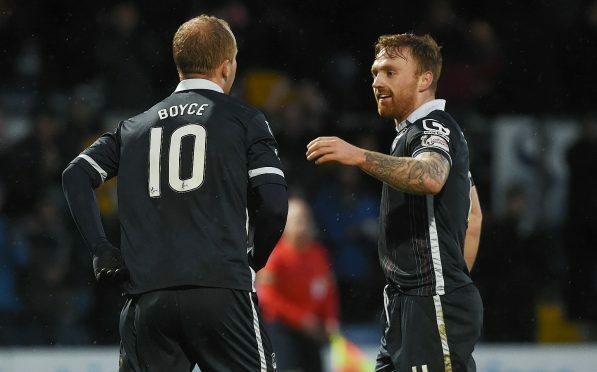 Craig Curran’s goal looked to have rescued a point for Ross County against Saints but an injury time goal from Chris Kane gave the visitors their fourth win at Victoria Park in a row. The Staggies laboured for long spells against an impressive Saints outfit who fully merited their win following their strong showing. Both mangers made changes to their line-up for the game with Ross County manager dropping Jim O’Brien and Alex Schalk to the bench with Craig Curran and Milan Lalkovic taking their place in the starting 11. St Johnstone were without leading goalscorer Danny Swanson and Graham Cummins with Blair Alston and Liam Craig coming into Tommy Wright’s side. Despite missing Swanson it was Saints who looked most likely to make the breakthrough and it finally came just after the half hour mark when County defender Jay McEveley’s attempt to cut out Blair Alston’s cross ended with him deflecting the ball past his own goalkeeper Scott Fox. County responded with a Michael Gardyne effort which hit the post and a Liam Boyce curling effort which went wide but the Perth side deserved their half-time lead. The visitors came close to extending it too with County midfielder Martin Woods clearing a Keith Watson header off the line before Fox saved from Saints forward Steven MacLean. Those blocks proved crucial as County drew level in the 73rd minute thanks to a Craig Curran strike, the forward controlling a deflected long range shot from Woods before firing past Zander Clark. Saints were not to be denied, however, and they grabbed all three points in injury time thanks to substitute Chris Kane’s excellent 20 yard strike which flew past Fox.